Everyone is talking about it but how many are actually doing it? Adaptive management is everywhere. Google it and you’ll get over five million hits, while academic search engines can return over 20,000 articles. These articles discuss a huge range of topics – from ecology and conservation biology through to epidemiology, medicine and even construction. And more are being written all the time. Adaptive management receives so much attention because it is intuitive, broadly applicable and conceptually appealing. Its basic premise is that as management proceeds, information is collected that improves knowledge of the system being managed. This knowledge is then used to improve future management practice, in an iterative process sometimes described as ‘learning by doing’ (Walters & Holling, 1990). Consequently, adaptive management should be a good way to manage systems that are poorly understood. Working with David Lindenmayer and Gene Likens, I recently assessed the current ‘state of the science’ of adaptive management in ecology, with the aim of quantifying the usefulness of the concept (Westgate et al., 2013). We did this by finding articles whose authors stated that they were part of an adaptive management project, then looked for similarities and differences between these projects. We found several unusual results. First, we quantified just how rare the actual application of adaptive management was in the academic literature. In a series of stages, we narrowed down our original 1,336 articles to 61 that explicitly claimed to enact adaptive management. Put differently, more than 95% of articles that discuss adaptive management don’t test it. Finally, few projects were able to sustain the effort to complete the adaptive management cycle. Most papers that claimed to be starting adaptive-management projects were recent (mean age = 4.8 years, n= 58 articles). Only four of the 13 adaptive management projects that we identified lasted longer than 10 years. Correspondingly, the number of projects that met adaptive management criteria decreased as we included criteria describing successively later stages of the adaptive management cycle (see the short article on ‘What is adaptive management?’). More specifically, all 13 projects described their management goals (stage 1), ten of which tested more than one management intervention (stage 4), but only five projects altered management in response to new information (stage 6). On the basis of our results, it is fair to say that the term ‘adaptive management’ is rife in the peer-reviewed literature. However, only a small but increasing number of projects have been able to effectively apply adaptive management to complex problems. 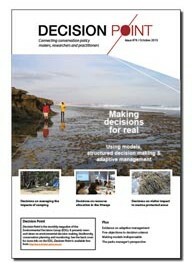 We feel confident that this number can be increased through better collaboration between scientists and representatives from resource-extracting industries; better communication of the risks of not doing adaptive management; and by ensuring adaptive-management projects ‘pass the test of management relevance’. Although not a specific focus of our study, an important consideration for potential practitioners should be the likelihood that adaptive management will provide useful, timely, and cost-effective information in their particular case. For example, if collecting further information will not improve management effectiveness, then adaptive management should not be considered (see Mcdonald-Madden et al., 2010). I think we did a good job summarizing the adaptive-management literature, but I also think the adaptive-management concept could be improved by addressing a couple of core concepts. 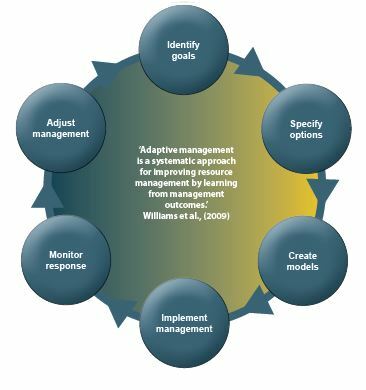 First, despite some very useful guides (eg, Williams et al., 2009), the term ‘adaptive management’ still means different things to different people. This is a problem because it means there is very little prospect that a practitioner could understand adaptive management from the academic literature, still less aim to use adaptive management to solve on-ground problems. Further, confusion over terminology hinders the development of these important ideas in the academic literature. Some of us at CEED will be working on this issue in the near future. Second, our review focussed on published literature, but it is likely that most management is carried out by people who have very little time or incentive to publish their findings, so we probably missed a lot of very exciting adaptive-management projects. If we could somehow harvest some of this experience it’s likely our capacity to effectively implement adaptive management would be improved. The bottom line is that despite the enormous literature on adaptive management, articles describing adaptive management projects are extremely rare. That means many of the outcomes of past interventions have not been appropriately evaluated. Application and monitoring of management interventions has been inadequate, limiting our understanding of important ecological processes necessary for effectively managing biological systems. Our review showed that a large number of practitioners are already doing a great job of testing management effectiveness in ecology and biodiversity conservation. As a result, strong progress has been made in identifying the mechanisms through which management interventions influence biological systems. What is needed in future is new ways to capitalize on this knowledge by iteratively improving management and research questions though time, and communicating those results to a global audience. McDonald-Madden E, PWT Baxter, RA Fuller, TG Martin, ET Game, J Montambault & HP Possingham (2010). Monitoring does not always count. Trends in Ecology & Evolution 25: 547-550. Walters CJ & CS Holling (1990). Large-scale management experiments and learning by doing. Ecology 71: 2060-2068.